At Infinitus Med Spa, cellulite reduction treatments are clinically proven to safely and effectively treat cellulite, providing both immediate and long term results. Cellulite is a common skin condition that causes an “orange peel” or “cottage cheese” appearance. Over 80% of adults (mostly women) suffer from cellulite. In the past there was no effective way to eliminate cellulite. 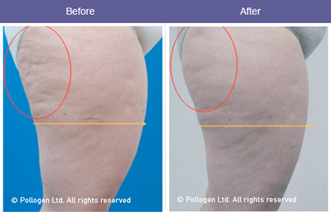 Thanks to the genius of today’s groundbreaking solutions we can now provide you with real cellulite reduction. 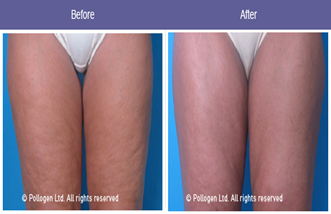 Using today’s latest TriPollar, TriLipo andTriFractional technology we help you to safely and effectively reduce cellulite. You get immediate and long term results. Treatments are non-invasive, virtually painless and administered in a convenient 'walk-in walk-out' procedure. Cellulite is a common skin condition that causes a dimpled, “orange peel” or "cottage cheese" appearance to the surface of your body. Cellulite occurs when fat cells below your skin ‘s surface expand. Your fat cells push upwards resulting in an uneven skin surface. 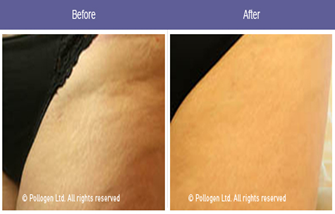 In addition the collagen bonds where the fat cells are located are stretched causing further unevenness to your skin’s surface. While both women and men have cellulite, it appears more frequently in women due to the types of fat and connective tissue that women have. No clear cause to cellulite has been identified. However, the most popular theories include hormonal factors, genetics, diet and lifestyle factors. Common treatments include creams and lotions that claim to break down the fat. The effectiveness of these solutions is mild at best because they cannotchange the fat cells. Another cellulite reduction technique is lymphatic massages. Lymphatic massages are effective in treating cellulite but the results are generally onlyshort term. The good news is the over the past decade, non-invasive therapies and minimally invasive therapies have emerged that target the subcutaneous tissuethat cause cellulite. At Infinitus Med Spa, our cellulite reduction solutions minimize fat cells in yourtarget area and strengthen and regenerate your collagen fibers. This reduces the volume of the fat cells, allows the skin to go back to its initial form , and strengthens your collagen fibers to ensure that your skin has the elasticity it requires. Our cellulite reduction treatments are safe, fast, effective, suitable for all skin types and will not interfere with your daily routine. Results are both immediate and long-term.